O' Canada - The Mickey Wiki: Your Walt Disney World Encyclopedia! The entrance sign to O' Canada. O' Canada is an attraction located within the Canada pavilion in World Showcase. "There were lots of bits and pieces. We had to schedule our shooting when events were happening and, of course, we were dependent upon weather"
After filming was complete, Disney had shot over 250,000 feet of film, which was then edited down to an 18 minute movie. Finally, the film opened as O’ Canada with the rest of the Canada pavilion on October 1, 1982. In 1987 the Canadian government wanted Disney to update O'Canada, and negotiations began that called for the country to pay $1 million dollars to create a new film. At this time, the Canadian government boasted about its active involvement in the pavilion. For unknown reasons however, the 1987 update never took place. In the year 2000, the Canadian Tourism Commission began to lobby for an update of O’ Canada . Although initially hesitant, Disney finally updated the film in 2007. On August 20, 2007, the original O’ Canada closed . Although Disney did not announce the reason for its closure, when the attraction reopened on September 1, it had in fact received an update . The new version of O' Canada features a combination of old and new footage, as well as a new narration by comedian Martin Short . The attraction's popular theme song, "Canada - You're a Lifetime Journey" was also rerecorded by Canadian sing Eva Avila, who won the singing completion Canadian Idol . The current version of O' Canada has been shortened to 14 minutes long . On November 19, 2018, Disney announced that a new film was being created for the Canada pavilion . It is unknown at this time what, if any, relation the new film has to O'Canada. The current version of O' Canada begins in a snowstorm, where the attractions voice over narrator tells guests that in Canada it snows 24/7, every day of the year. As he is giving his monologue, Martin Short emerges from the snow storm, and yells "Stop the movie!" He then tells the narrator that the audience needs to hear about Canada from a real Canadian (himself). After a brief back and forth, the attraction’s original narrator leaves, claiming that he is, "Going to the France pavilion film, where they appreciate an invisible narrator!". The next scene in the film takes guests to Niagara Falls, where Short explains that although many people think of the falls as an American attraction, half of the landmark (Horseshoe Falls) is actually in Canada. Short then takes guests to see some of Canada’s other landmarks. The tour begins in the Bay of Fundy in New Brunswick. Guests then view the countries west coast, before visiting Vancouver Island's gardens. Here, flowers and other plants are shown blooming. Following the garden scene, Short tells guests that nearby they can see Cathedral Grove, where some of the trees are 800 years old. At this point in the film, Short comments that Canadians have a love for the wilderness, and a montage of Canadian animals are shown. Following a scene involving a polar bear, Short has to admit that it does snow in Canada. However, he proceeds to put a positive spin on it by showing guests skiers and snowboarders performing tricks. Subsequently, curling is featured and Short confesses that he gets a little excited about the sport. The next scene in the film shows kids (Including a “young Marty Short” playing hockey at the Rideau Canal). Back in the present time, Short is shown in his hockey gear. As the ice below him breaks, he claims "looks like things are starting to warm up". A montage of warm weather sports including, white water rafting, horse racing, baseball, skateboarding and lacrosse are then featured. Vancouver, where Canada’s film industry is based. Calgary, where Short tells guests that outdoor adventure meets city living. The Calgary Stampede is also featured. Toronto, which Short describes as the height of Canadian sophistication. The Toronto International Film Festival is featured. Quebec, which is described as the cradle of French civilization in North America (It is also the only walled city in Canada). Finally, guests are taken to the largest city in Quebec, Montreal. Here, Cirque du Soleil is featured. After the montage ends, various average Canadians are shown, followed by more images of the Canadian landscape. 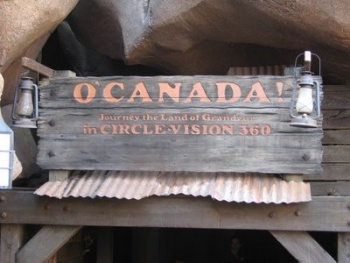 During this montage the attraction’s theme song “Canada You're a Lifetime Journey” plays. 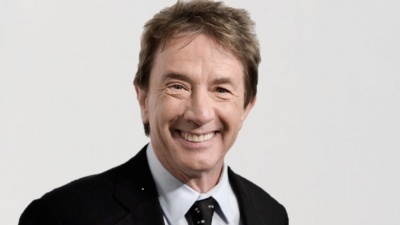 Martin Short then returns guests to Niagara Falls, where he invites them to visit Canada, by taking a left at the “big silver ball” and then heading north. Short ends his narration by saying that he has to go, because he has a FastPass for Soarin’. The original version of O' Canada was the only World Showcase attraction built without the input of a sponsor . O' Canada drew its inspiration from the popular Circle Vision 360 film Canada '67 which was shown during the The 1967 International and Universal Exposition in Montreal . 600 people can fit inside the O' Canada Theater . ↑ 2.0 2.1 2.2 2.3 Canada Pavilion New Hire Handbook. : Walt Disney Productions, 1982. Print. This page was last modified on 2 March 2019, at 20:03.